Beyond Agricultural Impacts: Multiple Perspectives on Climate Change in Africa presents the theories and methods commonly applied in climate change assessment from various locations in Africa, also inspiring further research that addresses the broad spectrum of societal impacts that result from altered climate status. Using case studies, the work provides insights into climate change impacts and adaptation with a lens on vulnerable groups in African agriculture, e.g. smallholder crop and livestock farmers, women and youth. 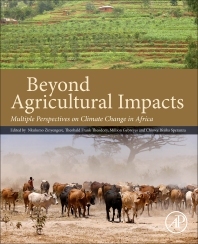 The book also highlights areas of further interest in climate change and agriculture research in Africa, all done through views from multiple disciplines in the agriculture and climate change nexus. Nkulumo Zinyengere is project manager and research lead with the Climate Development Knowledge Network (Africa). He holds a PhD in Environmental Science from the University of Cape Town, a B Sc. (hons) in Geography and M Sc. in Agricultural Meteorology (University of Zimbabwe). His research work has largely centered on climate change impacts and adaptation in various sectors in Africa. His interests are broadly on the intersection of climate, poverty and development in the African context. He has experience in applied climate science research and policy analysis and has been recognized as a future leader in sustainable development research through the German Ministry of Education and Research’s (BMBF) green talents awards. He is also an awardee of the African Climate Change Fellowship Programme (ACCFP). Theobald Frank Theodory is an environmental scientist focusing on climate change, adaptation, mitigation and Natural Resources Management. Currently, he is a Lecturer at the Institute of Development Studies (IDS), Mzumbe University, Tanzania. He obtained his Bachelor of Arts and Masters of Arts in Geography both from the University of Dar es Salaam, Tanzania. He obtained a PhD in Geography at the University of Bonn, Germany. He has a wealth of experience in research and outreach activities in areas of climate change adaptation and mitigation, natural resources management, land investments, and urban water governance. He has lectured Climate Change Adaptation and Mitigation, Political Ecology, Project Planning and Management, Environmental Issues and Sociology, Participatory Rural Appraisal subjects for over 6 years, as well as coordinating postgraduate programmes within the Institute of Development Studies. Million Gebreyes is a Post Doctoral Research Fellow at the Institute of Geography, University of Bonn, Germany. He holds a PhD from the department of Development Geography, at the University of Bonn, Germany. Currently he is working on a Belmont Forum funded research project, looking at Water-Food-Energy nexus in the Blue Nile Mountains of Ethiopia. Before his doctoral study, Million worked as a lecturer in the department of Rural Development and Agricultural Extension and Assistant Strategic Planning, Monitoring and Evaluation Officer at Haramaya University, Ethiopia. Million’s broad research interest areas include climate change adaptation, natural resource management, agricultural advisory services and pastoralism. Chinwe Ifejika Speranza is Professor of Geography and Sustainable Development. She heads the research group Sustainable Land Management and Land Systems at the Institute of Geography, University of Bern, Switzerland, where she earned a PhD in Geography. She also has an MSc In Geography from University of Zurich, Switzerland. Her teaching and research focuses on sustainable land and water management including land use dynamics, ecosystem services, protected areas, and land degradation. Her work on climate change currently focuses on resilience and adaptation to climate change in Africa, in particular, on flood risk and vulnerability research, adaptation to climate change in African agriculture, agriculture policies and on climate policies at international and national levels. She teaches in undergraduate and post-graduate courses and supervises PhD, Masters and Bachelor theses. She worked several years on Geographic Information Systems and its use for development planning and the management of natural resources, and on food security, drought vulnerability and risk in agro-pastoral areas. She serves in editorial and scientific advisory committees. She has field experience in sub-Saharan Africa, Sarawak-Malaysia, Bolivia and Switzerland.